Last Thursday, Nāpali Souza (pictured above, right, with Noah Serrao), one third of the trio behind label Salvage Public, was busy affixing buttons and grommets to surf shorts at the fashion resource center Cut Collective in Ward Warehouse. “They have the equipment we need,” he explained. Souza and his partners were in the final stretch to get their merchandise ready for their first store—a sliver of space in Ward Village’s South Shore Market opening this Friday, Nov. 11. Taking inspiration from Manhattan’s Chelsea Market, Howard Hughes Corp. is featuring island-based retailers and food purveyors. Salvage Public, founded in 2012, is one of the 13 emerging companies that have found a home in this space under T.J. Maxx, and also happens to be one of the entities arts of Hawai‘i curator Healoha Johnston selected to be in the exhibition Hawai‘i in Design, we are proud to report. Since the exhibition opened in March, Salvage Public, which makes surf-inspired T-shirts, surf shorts and caps for men, has been all over the media, from the New York Times’ T Style Magazine to Hawaii Public Radio. And now they are a physical space. While the work has been hard, “it’s good fun,” says Nāpali. “We have support coming from so many different directions, from our families and girlfriends, and it’s little plugs like you guys.” The Salvage Public team is still learning as they go along. 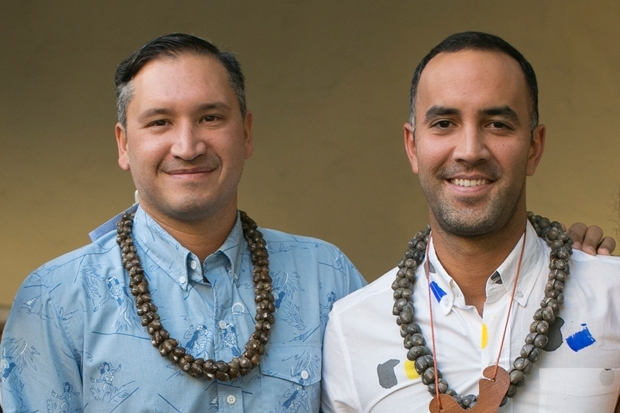 You can meet Nāpali and his partners Joe Serrao and Noah Serrao at South Shore Market on Nov 11. “Weʻll be there all day!” says Nāpali.